AHA! "Crisps" contain oats and "crumbles" do not! So yay, this is definitely a "crumble". But woah was I way off on why. Pays to look it up and figure stuff out. Whatever you want to call this, make sure you don't refer to it as a "cobbler", because then you're talking about a fruit filling topped with a sort of biscuit dough. Did I lose you yet? Because I'm like holding on by a thread. Sheesh, so complicated! Let's just call it "fruity goodness", shall we? 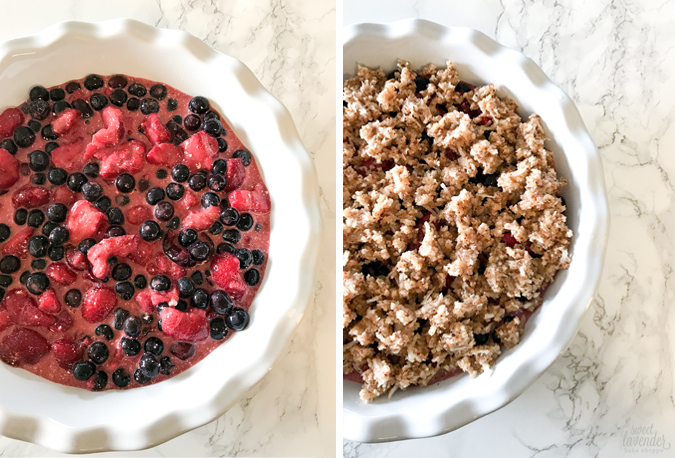 This CRUMBLE is summer in a dish and pretty perfect for your 4th of July celebration tomorrow! It can be made the day before and stored in the fridge overnight. Just gently reheat before serving. It's got a plethora of summery fruits like strawberries, blueberries and my favorite- cherries. 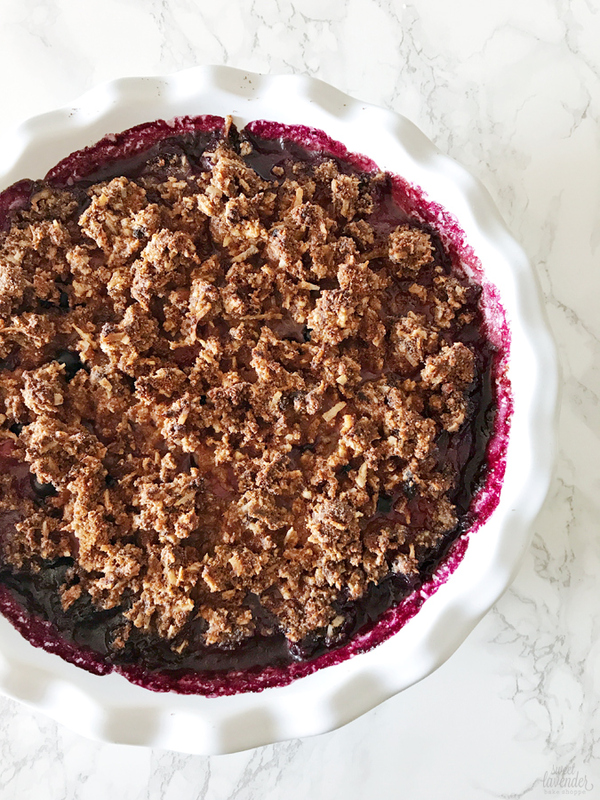 The filling is just barely kissed with a little sweetness and then topped with the yummiest almond meal/pulp crumble topping. I love this dish because its such a great way to use up all that leftover almond pulp you've got stashed in your freezer from all the homemade almond milk you've been making! Bueller?. . . . . . . . .
2. Open all the bags of defrosted fruit, and pour into a colander set over a large bowl. Drain all of the defrosted fruit into that bowl. Remove 1/4 cup of the liquid and add the berries back into the remaining juice in the large bowl. 3. To the bowl with fruit and juice, add the coconut milk, maple syrup, coconut sugar, arrowroot, vanilla and cinnamon. Gently stir until the arrowroot is completely dissolved. 4. Pour mixture into a 9-10" ceramic pie dish and set aside. 5. Wipe bowl and to it add all of the topping ingredients EXCEPT the coconut sugar. Mix until completely combined. 6. Sprinkle topping evenly over the fruit mixture, so that it forms a nice even layer. 7. Finally, sprinkle the coconut sugar over the crumb topping. 8. Place the pie dish on a baking sheet (in case it bubbles over) and bake in the oven for 30 minutes or until filling is bubbly and top is browned. Allow to cool for 10-15 minutes before serving. Crumble will thicken up as it cools. This post contains some affiliate links. If you click a link and make a purchase, I may make a small commission at no additional cost to you. This helps me continue to bring new and lovely content to you!